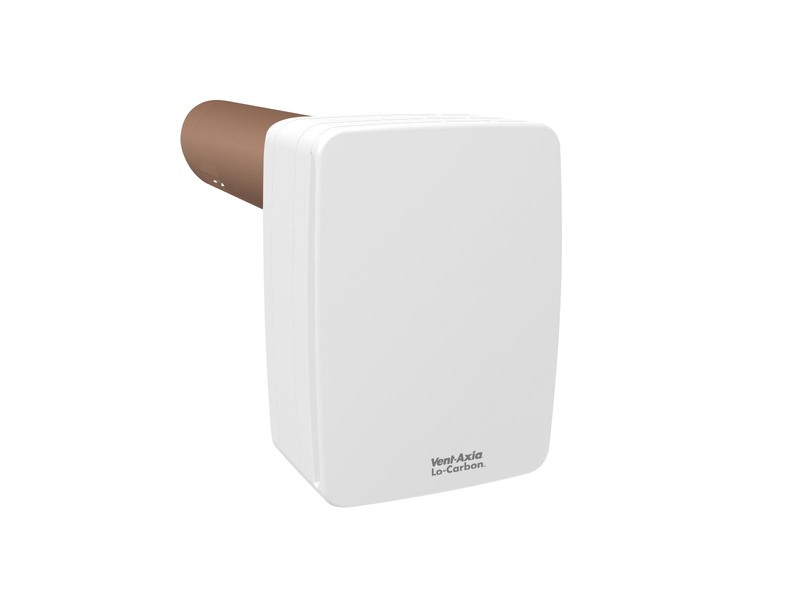 The Vent-Axia Lo-Carbon Tempra is designed to fit in 100mm diameter hole and is suitable for refurbished properties in kitchen, bathroom, toilet or utility rooms. The unit meets the performance requirements for continuous extract fans under the current Building Regulations Approved Document F.
The Tempra is available in three models, a P version with pullcord control, a T version with overrun timer and an HTP version with built-in pullcord, overrun timer and humidistat. Two spigot lengths are available; 320mm and 460mm. The manual summer setting allows the unit to be set to extract only, helping to prevent a dwelling becoming too warm in hot summer conditions. Tempra can be set to run continuously at 6 l/s or 9 l/s, boosting up to 15 l/s, recovering heat from extracted air and returning it to the dwelling. The unique, compact heat exchanger has a temperature efficiency up to 78%, saving energy and reducing your carbon footprint. For intermittent extract the Tempra is set to 15 l/s. The Tempra is also designed so that the replacement air being introduced is at a reduced rate ensuring that the room being ventilated is still under a slight negative pressure. This ensures that fresh air is bought into the room from the rest of the house preventing humid air migrating. The Lo-Carbon EC/DC motor with twin impellers consumes as little as 3.2 Watts on trickle rate and runs almost silently at only 20dB(A). The unique heat exchanger design allows the Tempra to be fitted in a 100mm diameter hole, allowing it to replace standard 100mm extract fans while giving all the benefits of heat recovery. Maximum wall thickness is 460mm. A longer version of the Tempra is available, designed for installations where the wall thickness is between 321mm and 460mm. 460mm models are identified by an ‘L’. Easy installation and maintenanceWith simple construction Tempra is both easy to fit in the same location as an existing 100mm diameter fan, and with easy access to the heat exchanger for maintenance. Low energy consumption means the Tempra exceeds the energy saving requirements in Part L, Conservation of Fuel and Power. Switching on/off or from trickle to boost speeds is possible in several ways: Switched Live, Pullcord or Humidistat. Overrun and delay start timers are also available. The extract-only Summer Setting helps keep you cool by closing off the intake from outside, reducing the amount of warm air entering the dwelling. The Tempra will fit 100mm through the wall applications as a straight replacement for a traditional extract fan. Air flows can be set to quiet, low speed continuous rates or high speed intermittent boost rates. The unique twin impeller design consumes as little as 2.0 Watts and operates almost silently on trickle setting. Apart from removing odours, providing fresh air and recovering heat, this appliance extracts airborne impurities such as dust, dirt and grease. These gradually build up and detract from the efficiency and appearance of the appliance. To ensure peak performance, the heat exchanger should be cleaned as required in accordance with the instructions supplied. There are three means of mechanical ventilation specified in the Building Regulations: System 1, Intermittent Extract Fans, System 3, Continuous Mechanical Extract (MEV) and System 4, Continuous Mechanical Supply and Extract with Heat Recovery (MVHR). System 1. Instead of using a traditional intermittent extract fan, the Tempra, running on continuous setting may be used. This method has the advantage of reducing the overall background ventilation requirement by 2500mm and removing the need for background ventilation in the room in which the unit is sited. System 3. Using Tempra in conjunction with MEV/dMEV permits a reduction in the overall dwelling extract rate. This is particularly useful for extensions, loft conversions and refurbishments which might otherwise be difficult to ventilate. Constant trickle speed with pullcord to boost or intermittent operation by pullcord. Constant trickle speed with switch live to boost or intermittent operation by switch live. Constant trickle speed with humidistat and linked overrun timer to boost or intermittent operation by switch live.